Jeff For Banks: What's With Regulator Agita Over Bank Commercial Real Estate Lending? What's With Regulator Agita Over Bank Commercial Real Estate Lending? Anxiety, anxiety, anxiety. The recovery from the Great Recession is eight years running. Ample time to look down the road towards our next recession. And regulators are getting anxious. Anxious about commercial real estate (CRE) concentrations. Last December, Astoria Financial Corp. and New York Community Bancorp called off their planned merger. Why? They couldn't get regulatory approval. Both institutions were over the CRE concentration guidelines, so putting them together would exacerbate this risk, so the regulatory thinking must have been. Today, I read an American Banker article on how a multi-billion dollar bank is going to ramp up its business lending. Why? Reading between the lines, this bank is likely over the CRE guidance levels, and were probably getting grief from their regulators about it. To remind readers, in 2006 the OCC, Federal Reserve, and FDIC issued joint interagency Guidance on Concentrations in Commercial Real Estate Lending. They need a marketing person to title their reports. Maybe sub out an economist or two. To summarize, banking institutions exceeding the concentration levels should have in place enhanced credit risk controls, including stress testing of CRE, and may be subject to further supervisory analysis. Whatever that means. 1. Construction concentration criteria: Loans for construction, land, and land development (CLD) represent 100% or more of a banking institution's total risk-based capital. 2. Total CRE concentration criteria: Total nonowner-occupied CRE loans (including CLD loans), as defined in the 2006 guidance (“total CRE”), represent 300% or more of the institution’s total risk-based capital, and growth in total CRE lending has increased by 50 percent or more during the previous 36 months. The OCC did an excellent analysis of the impact of this guidance in 2013. If you have some free time to read it, I encourage you to do so. The upshot of the analysis, in my opinion, is that the risk can be further limited to CLD lending, more so than straight, plain vanilla CRE lending that is so common in community financial institutions. 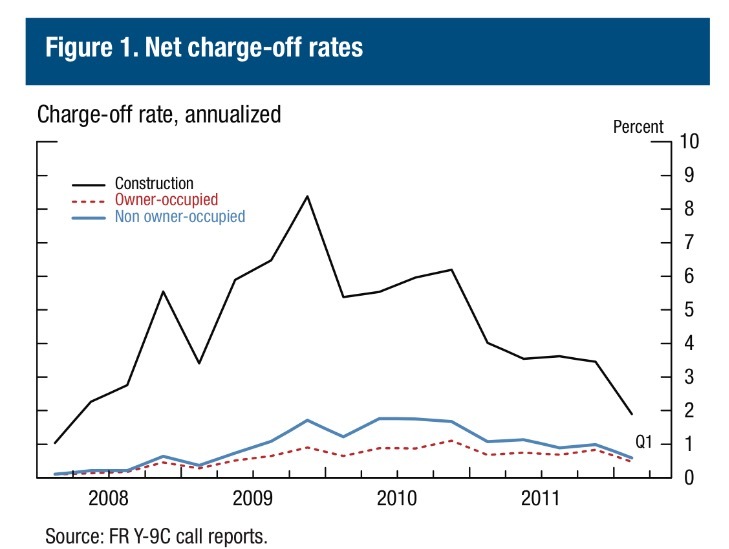 See the chart below from the OCC report for net charge-offs during the Great Recession. To be balanced, and not a news media outlet, it is true that banks that grew CRE fast, i.e. over the guidance levels mentioned above, regardless if in the CLD or straight plain vanilla categories, were more likely to fail during the period measured. But isn't fast growth by itself an indicator of increased risk of failure, regardless of the loans that fueled the growth? Risk mitigants tend to lag growth, especially fast growth. And success is the great mollifier to risk managers that wish to take away the punch bowl when the party's rockin'. So, yes, fast growth leads to greater failures. But that's why fast growth is riskier, and tends to reap greater rewards for stake holders. Look at technology companies. Their shareholders are highly rewarded for fast growth. And they take on greater risk, because earnings have yet to materialize. I would like to take issue with the implicit pressure on financial institutions for going over the 300% guidance levels for plain vanilla CRE. Note that the guidance says AND 50% growth over the past three years. But is that how it is being examined and enforced? Or are examiners, and perhaps bankers, pulling back on bread and butter lending, seeking loans where they have less experience or there is riskier collateral? The below two charts tell a story. The Great Recession lasted from the fourth quarter 2007 through the second quarter 2009, according to the National Bureau of Economic Research. For the below chart, I took every bank and savings bank, not federal thrifts because during this time they still filed TFRs versus Call Reports, and therefore their loan categories were different. But look at the asset classes that were on non-accrual during this period. How significant was CRE lending to the souring of bank loan portfolios? The following chart is from my firm's profitability outsourcing service. It shows the pre-tax profit as a percent of the loan portfolios measured. 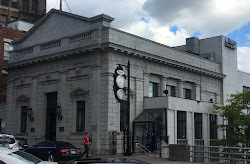 We perform this service for dozens of community banks. CRE lending remained more profitable and stable then C&I portfolios, which seems to be the asset class banks try to increase to offset the risk of CRE concentrations and raising the ire of their examiners. 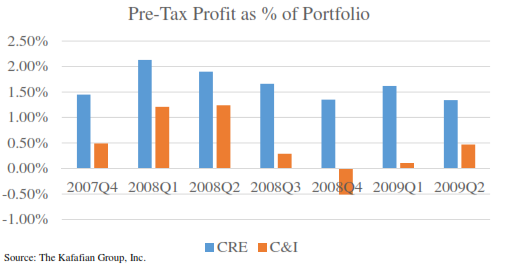 CRE not only remained profitable during the Great Recession, but more profitable and more stable than C&I. Indeed, even today, CRE is the most profitable community banking product. If you wondered why community banks feast on it, there ya go! I don't want to suggest that banks continue packing on CRE and relegate C&I to the back burner. C&I loans are typically smaller than CRE, are more difficult to underwrite, and require more resources to monitor. Yet the pricing we see in our product profitability service does not show bankers getting paid for these challenges. C&I spreads were very close, and in some institutions inferior, to CRE spreads. Also, there are an increasing number of technology solutions that can reduce resources needed to more profitably deliver C&I loans to the market. So, don't let this blog post motivate you to double down on CRE, and turn your back on C&I. What do your customers demand? What is the trend in your market? How can you reinvigorate economic vitality into your communities? Don't let regulatory guidance or the inefficiency in your lending processes answer those questions. Let your markets and customers do the talking. It is remarkable that regulators continue to focus on CRE despite clear and convincing statistical evidence that the risk profile (especially when excluding CLD and including 5+ multifamily) is superior not only to C&I but also to portfolio 1-4 residential product (net chargeoffs run slightly lower as you showed above but nonaccruals run much higher and economic cost to collect running through the income statement is really high as a % of loan size and often never collected even if the loan is paid off at par via sale or foreclosure). When you think about it, the reason for this profile is fairly clear - NOO CRE tends to have multiple sources of repayment (principal sponsor plus multiple cash flow streams from property plus optionality to retenant if tenant businesses fail plus option to access collateral as lender and sell) whereas C&I loans generally have no diversified support (sponsor is business owner, collateral of uncertain value if any, any pledge of personal real estate costly and lengthy process to get at) which is why C&I loans tend to have binary outcomes (when they fail, high percentage of balance charged off). I think many smart regulators - particularly at working and mid level - acknowledge this, but there seems to be strong institutional commitment at higher level to certain elements of the guidance, almost religious in its ahistoricism and aversion to data. I'm also concerned about regulators taking only a piece of the guidance such as the 300% threshold and encouraging bankers to buck market demand of land outside of their expertise.